It is 1942 and Steve Rogers (Chris Evans) is a determined and patriotic young man eager to join in the fight against the Nazi’s. Unfortunately despite his willingness he is a sickly 90 lb specimen and is rejected for military service. Feeling helpless and frustrated his life on the sidelines changes when he is recruited by Dr Abraham Erskine (Stanley Tucci) and Rogers becomes a central part in Project Rebirth. After displaying exemplary courage Rogers is injected with a serum that genetically transforms his puny frame into the pinnacle of human physical ability. Rogers/Captain America now enters the fight with his international team of allies headed by the world-weary and sardonic Colonel Chester Phillips (an on form Tommy Lee Jones) and Peggy Carter (a spirited Hayley Atwell). Hugo Weaving is on bad guy duty as Captain America’s nemesis Johan Schmidt aka The Red Skull who is head of Hitler’s advanced weapon division and the international terrorist organisation, HYDRA. The scene is set for some epic fighting and the age-old struggle between good and evil. When I saw the trailer for this film I was worried that it would be a cliché-ridden actioner that had its heart in the right place but was ultimately misguided. Oh, how wrong I was! 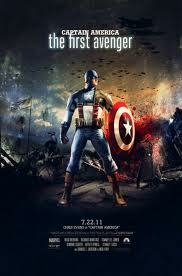 Captain America is not a flag waving farce. Instead it is a well-scripted, tongue in cheek homage to the Marvel character with plenty of humour and frenetic action along the way. The filmmakers have captured the Second World War era exceptionally well from the streets of 1940's New York to the corny war bond drives that poor Steve Rogers/Captain America must participate in before serving the allied cause in war torn Europe. There is the usual brief but amusing Stan Lee cameo as well as plenty of gadgets and hardware provided by Tony ‘Iron Man’ Stark’s father, Howard (Dominic Cooper). The most important thing is that it is all huge fun. The audience I watched the film with were of all ages and really enjoyed it, laughing and gasping in all the right places. Marvel’s big gamble seems to have paid off and it is all nicely set up for the forthcoming ‘Avengers’ movie scheduled for release next year.